Starting life high on the Staffordshire Moors, the Trent runs for 185 miles before joining the Great Ouse and then emptying into the Humber Estuary below Immingham. 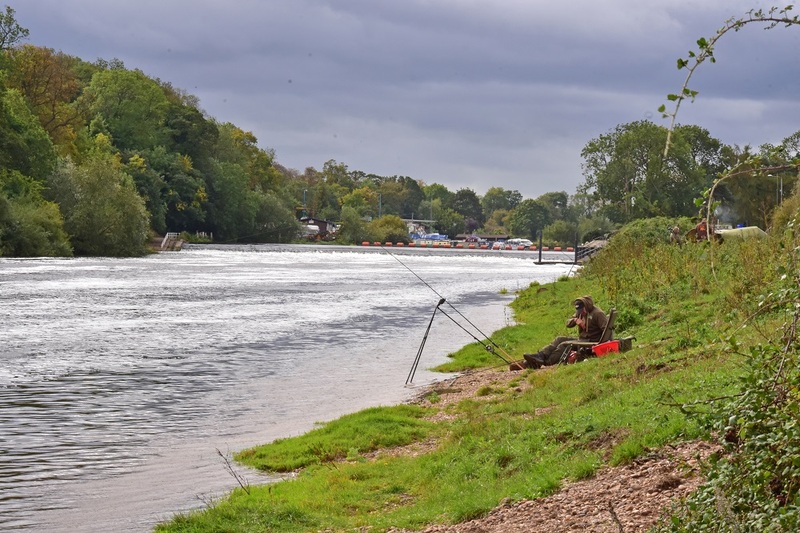 When you consider that even a decent-sized barbel is less than four-feet long, it doesn’t take a genius to work out the fact that they have a lot of places to hide. The first thing for me is homework. Local tackle shops, bailiffs or regulars of certain stretches all have brains worth picking. This should at least put you in the ‘right’ areas. Regards much of the Trent, there are certain weirs that are prolific, but due to this they are nearly always busy, booked up or syndicated. That means most of the time you’ll be targeting open stretches of river. For me there are three main areas to target on the Trent. 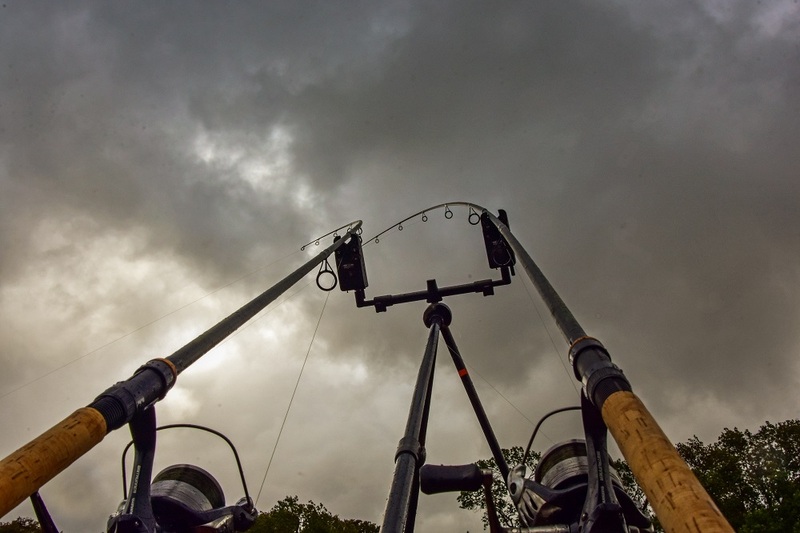 The first is the inside line – two to three rod lengths out. 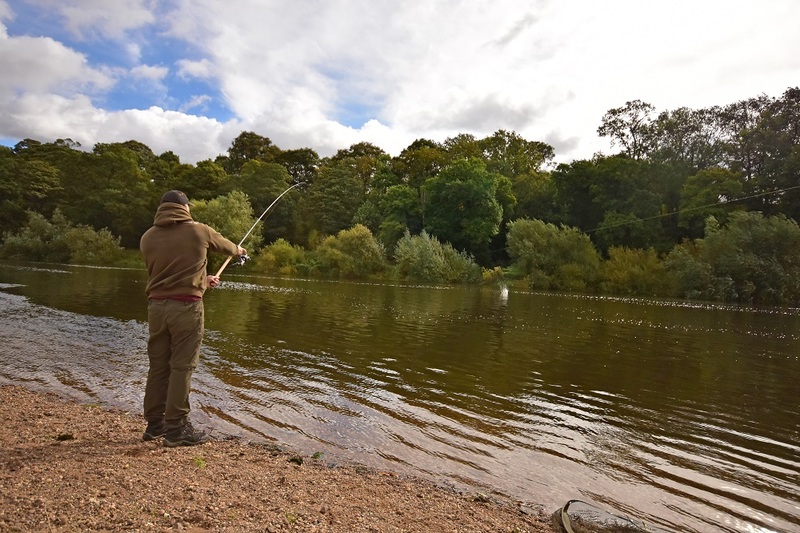 This is a classic feature on any venue – river or stillwater – as the fish love to patrol along these slopes as they tend to be where any natural food gets deposited. The second location is around three quarters of the way across, as again there tends to be a deeper ‘boat channel’. This again is a very prominent feature on the river bed. Finally, bends, especially if you can fish on the inside, casting to the crease, where the fast water meets the slower flow. Again, any natural food will end up being deposited in these areas, so the fish will never be too far away. Like any big river you need at least 2lb test curve rods and 15lb mainline. That may sound very heavy, but there are a lot of very big fish in the river now, add to this the vast collection of rocks and snags the carp-like tackle makes sense. No one wants to experience that feeling of ‘the one that got away’! I will also place the rods high in the bank sticks to ensure that the maximum amount of line is out of the water. This means I can get away with using slightly lighter leads or feeders as there will be less water pressure on the line. You can of course put a bow in the line if needed to hold station, but if there is a lot of detritus coming down the river, that may not always be possible. You’d be surprised how sensitive the bites are, even with a big bow as the water pressure keeps the bow super tight. The set-up is the barbel standard free-running rig with a three-foot hooklink of Tungsten Loaded braid to a small rig ring on to which I tie a shorth length of soft 15lb braid. This means the hookbait is free to move in the flow, but if the point blunts on the size 12 hook I’m using, I only have to change that short length, not the entire hooklink. Above the lead I have a three-foot leadcore leader. This is not to keep the terminal end on the riverbed, it is more an insurance against the snags in the river. The knot also traps any weed that runs along the mainline, so keeping the hooklink clean. Paul likes to use leadcore above the feeder or lead and uses a short length of soft braid down the hook to allow his hookbait to move freely. 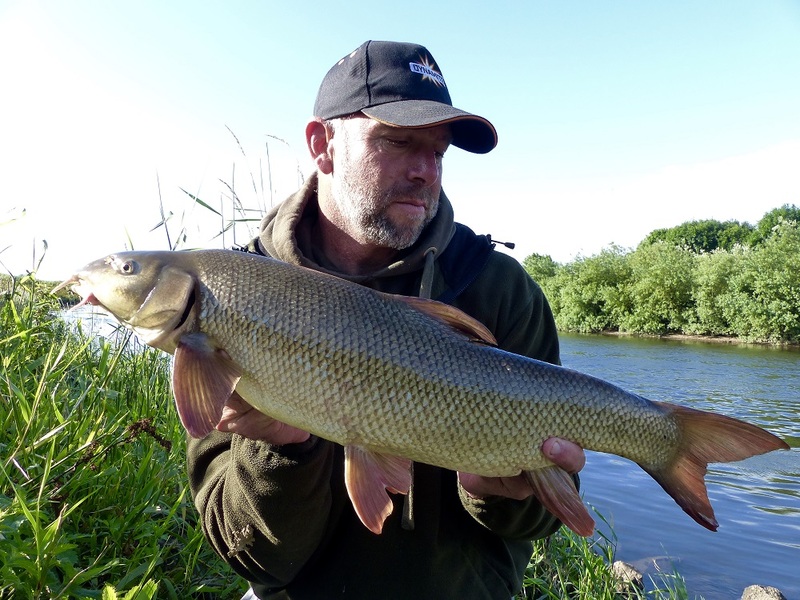 I have seen so many barbel spook off feeders that I have changed my approach these days. On the downstream rod I fish a lead and on the upstream one I use a feeder. This way the barbel will follow the feeder trail upstream but will hopefully encounter the lead rig first. I reckon this is the reason I tend to catch the bigger fish on the downstream rod. After this, when they travel further upstream, they will then come to the second hookbait and so never quite reach the feeder. Using this technique, I have the best of both worlds. 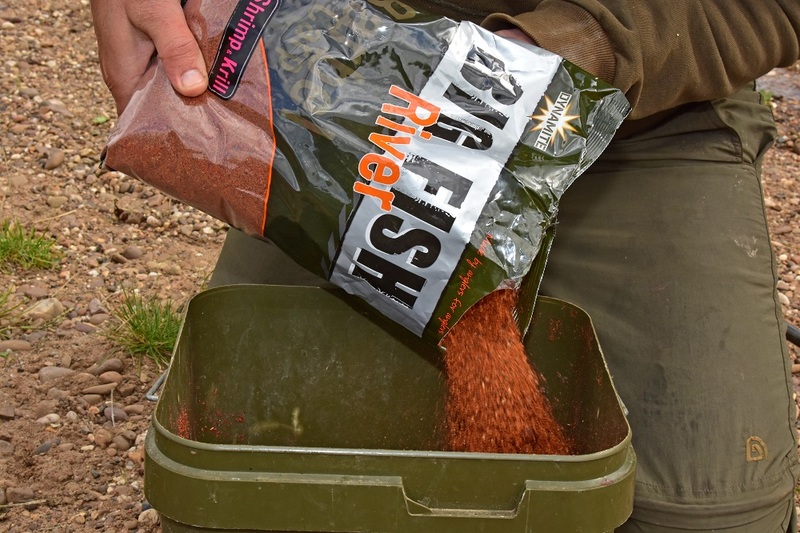 How heavy should your feeder be when barbel fishing? Regards the weight, this is day-dependent, on flow, depth etc. I will always use as light as I can get away with though, especially in daylight hours when the fish can be particularly spooky. Recently I’ve been trying out the new Big Fish River range. I am using Shrimp and Krill, although I have had a lot of success on the Cheese and Garlic too. Regards the Busters hookbaits, I will trim them down at this time of year as the barbel have seen a lot of pressure throughout the summer. And, removing the skin off the bait helps with the flavour leach. 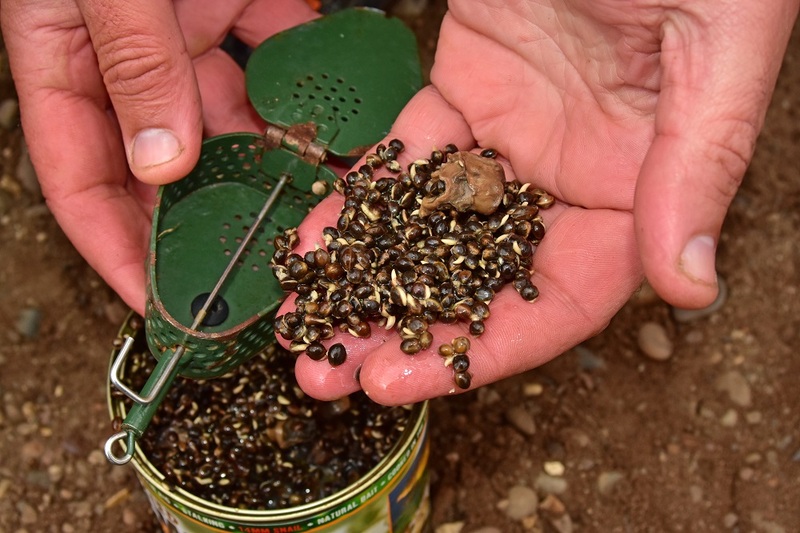 The other thing is that the groundbait has loads of small and large particles and pellets in it so a smaller hookbait better ‘matches the hatch’ I find. 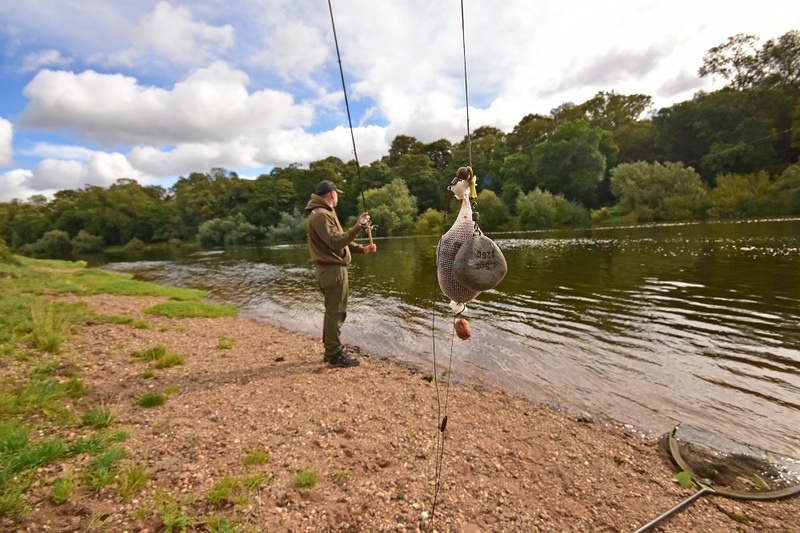 But, with the Trent being the Trent, it is always a good idea to bring a few alternative baits. One of these is Hemp and Snails. The smaller ones I plug in a groundbait feeder, then I will fish one of the Specimen snails on the hook. The Trent is a very hard river to fish in the day, so going with something more natural can often bring rewards. Within the BFR range there is also pastes and liquids, neither of which should be ignored. 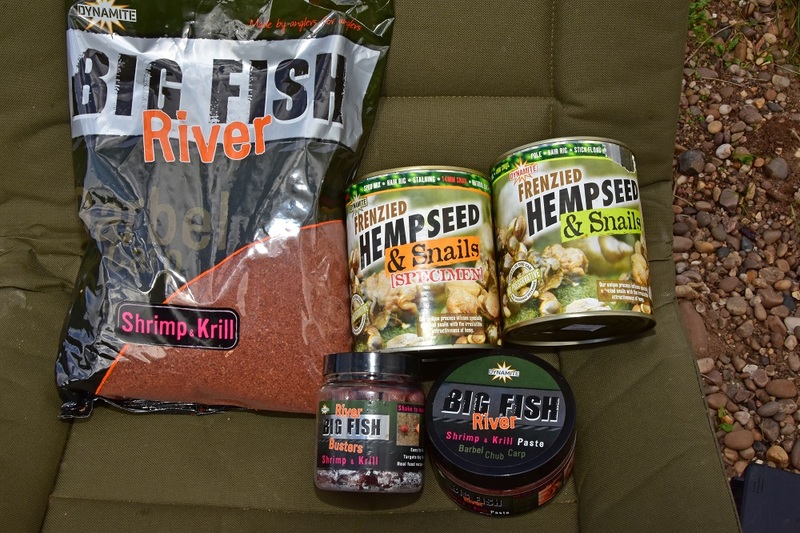 Everything you need for a day’s barbel fishing including some hemp & snails! If I’m fishing close in, I will kick off this area with one to two pints of loosefeed fed through a bait dropper. This will be a mixture of hemp and pellets generally. I will also spread the loosefeed over an area the size of a snooker table to give the fish room to graze. On the longer line, I look to start with 10 to a dozen large feeders, again packed with hemp and pellet but plugged with groundbait, the feeder is then used like a spod, to create a large feed area. After this, I will look to cast every 20-minutes or so for the first two hours. Then, if no action is forthcoming, I will slow this down to every three-quarters of an hour to an hour. I have already put out quite a bit of bait, so you don’t need to keep topping up with loads more. 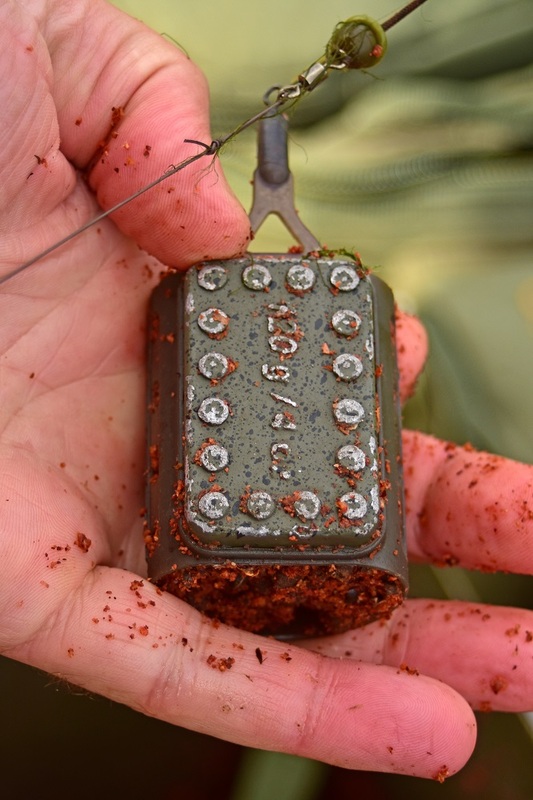 Apart from this, the usual feeder rules apply – like casting to the same area and picking a far bank marker etc. I also never clip up as this is a recipe for losing a rod! As you can see, I do nothing difficult, but, over the years, these tactics have allowed me to land barbel to an impressive 16lb 8oz.